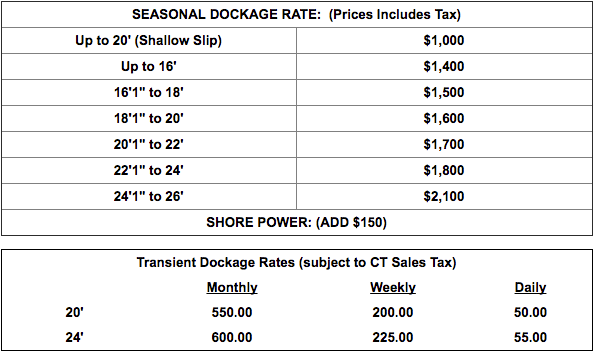 A $500 Deposit is required by March 28th to secure your dockage slips for the season. If no deposit is received for the next year by March 28th your slip may be rented to those on our waiting list. RATES: RATES ARE DETERMINED BY THE OVERALL LENGTH OF YOUR BOAT, TO INCLUDE BOW PULPITS, SWIM PLATFORMS, ETC. YOUR BOAT MAY BE SUBJECT TO MEASUREMENT, AT THE DISCRETION OF THE MANAGEMENT. PAYMENT: All balances are to be paid in full before slip usage. IF YOUR BALANCE IS NOT RECEIVED BY APRIL 15th YOUR SLIP WILL BECOME AVAILABLE FOR RENT, AND YOUR DEPOSIT WILL BE NON-REFUNDABLE. Trailers left for more than 1 day are subject to storage charges and/or removal from the yard. The marina reserves the right to haul at owner’s expense, any boat found in the wrong slip or whose fee has not been paid. Slips are not transferable. Slip payments are non-refundable. If a boat is sold and the new owner desires the slip, the new owner must sign a new slip contract. Unauthorized boats will be charged transient rates or hauled out. The marina reserves the right to verify length overall (LOA) and the beam of any vessel. Any vessel deemed by measurement to be misrepresented by owner will be reassigned to an appropriate slip at the marina’s discretion. The owner will then be billed the appropriate rate. All stored trailers must be paid for in advance and must be clearly marked with owner’s name. ***DOUBLE BAG FISH BEFORE PLACING IN DUMPSTER. YOU WILL GET ONE WARNING. THIS IS A MARINA THAT ALSO SELLS YACHTS! THERE WILL BE NO STINKY FISH SMELL HERE AT LOUIS MARINE!!!!!! Fresh water on docks. This is city water. DO NOT WASTE! You must provide your own hose and nozzle. The management will remove any hose without a nozzle. You must request permission before attaching any object such as hoses, cushions, rugs, fenders, etc. on docks or finger piers. Many of these objects will cause the docks to rot after a short period of time. No lobster pots will be stored on the docks or anywhere else on the marina property. No boats shall be operated in excess of 5 mph. NO WAKE, PLEASE! No pumping stations for holding tanks will be furnished by the marina. Owners must make arrangements for legally discharging waste. Dogs will be admitted to the marina only under leash and must not run loose on the grounds. Owners are obliged to clean up after their pets. Failure to do so will result in the management refusing the owner the privilege of bringing their pet to the marina. No campers or mobile homes are allowed on marina property. Your responsibility: In the event of rain or wind, each owner must come down to take care of his own boat, or haul it out. None of the marinas hold any responsibility for the boats or carry any insurance for loss or damage by weather. If you can’t come down personally, you should make arrangements for family or friends to take care of your boat. In case of hurricane, all boats are to be removed from docks. If owner has not removed his boat, the marina reserves the right to remove the boat at the owner’s expense, bearing no responsibility for loss or damage. In the event your boat sinks, for whatever reason, you are responsible for any and all damage done to the docks. You will be charged for labor and parts involved in the repairs. Insurance: The marina is not responsible for loss or damage by nature, fire, vandalism or theft of boats, cars, or trailers on our premises. The marina does not carry insurance for such loss. In addition, the marina is not responsible for any loss or damage to cars in the parking lot resulting from flooding. Repair: The owner has the right to repair his own boat. The marina can provide a temporary slip with electricity for no more than a day. Owner must use his own tools. Remodeling, improvement, or major repair should not be done on the premises. Brokerage: 10% of sold price shall be paid if boat was sold in the yard. 2% of sold price shall be paid if boat was sold by the owner or other broker, but within our premises. All guests MUST be accompanied by a slip rental boat owner. NO fueling is allowed on the docks. Note: These rules and regulations are all very basic and are designed to make Louis Marine a most pleasant Boating area.